We take the work off your hands, finding just what you want, when you want it! At Image we’re able to help with those awkward ad-hoc or one-off requirements. 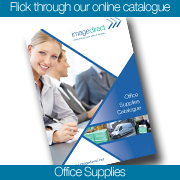 You need not worry if you can’t find an item within our catalogue or our product range as we can probably still get it for you! Sourcing those one-off requirements is all part of our service. Our experienced customer service team is skilled in locating and sourcing from an extensive range of suppliers across thousands of products. Our specials service saves you time and inconvenience of scanning numerous catalogues and administration in arranging one-off purchases.